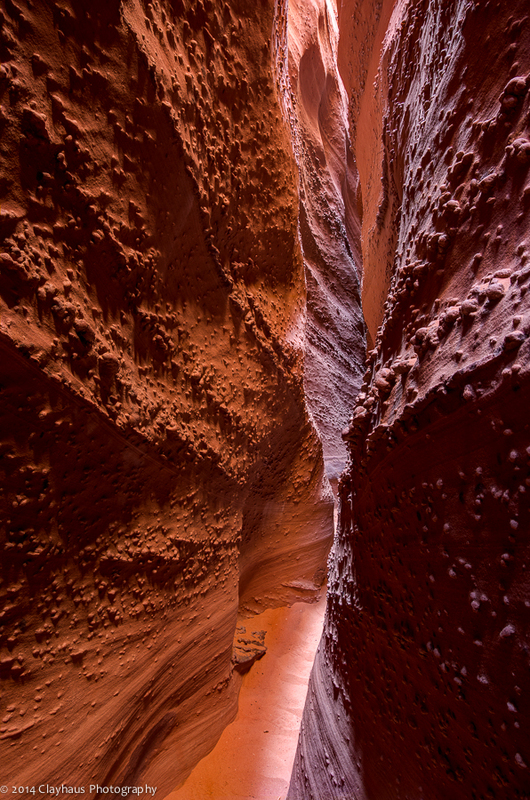 There is a slot canyon in Grand Staircase-Escalante National Monument called Spooky. 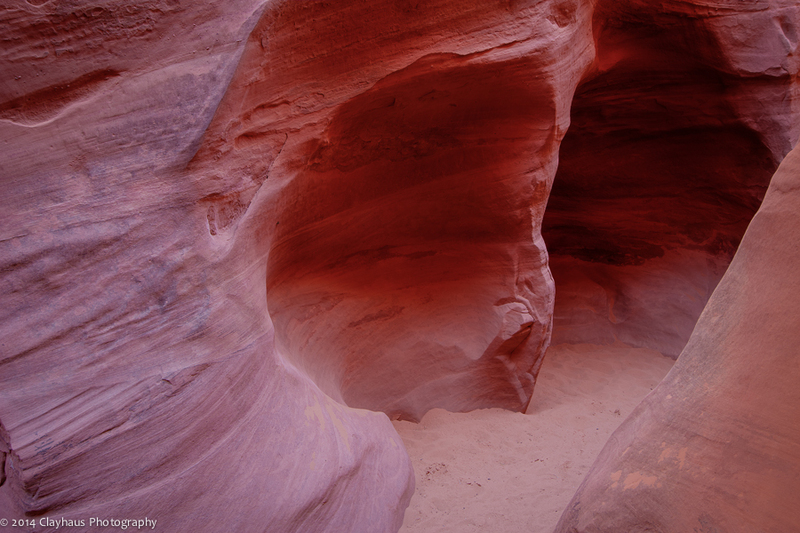 It starts out as many slots do: a sandy defile surrounded by red walls leading who knows where. Pretty quickly the way gets twisty-turny and narrow. Lots of nice curves and angles unfold. The shadows grow and the walls rise, though never really that high. In some sections, strange, rough nodules pepper the otherwise striated walls. Hard nodes of harder sandstone, apparently. The walls continue to narrow and, markedly, the light changes taking on a warm pinkish-orange tone. 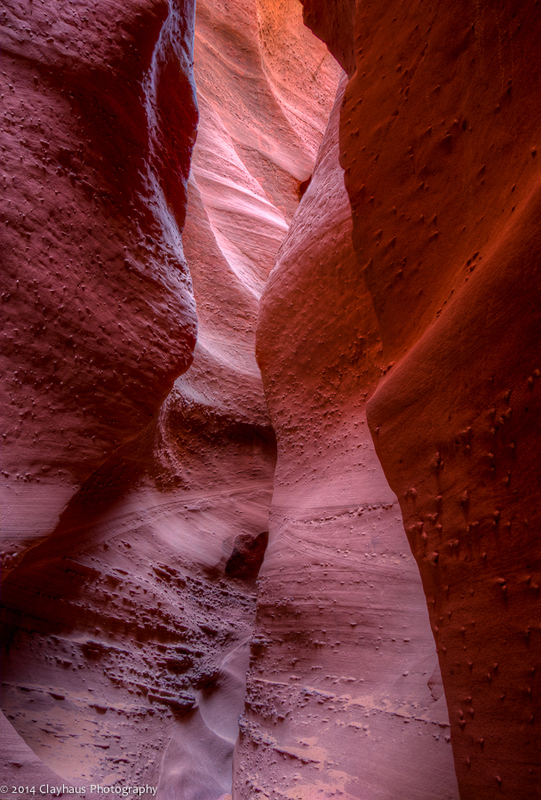 It’s the red-rock canyon glow, so prevalent in the Southwest where light has the opportunity to bounce off of the red or orange or pink sandstone walls. 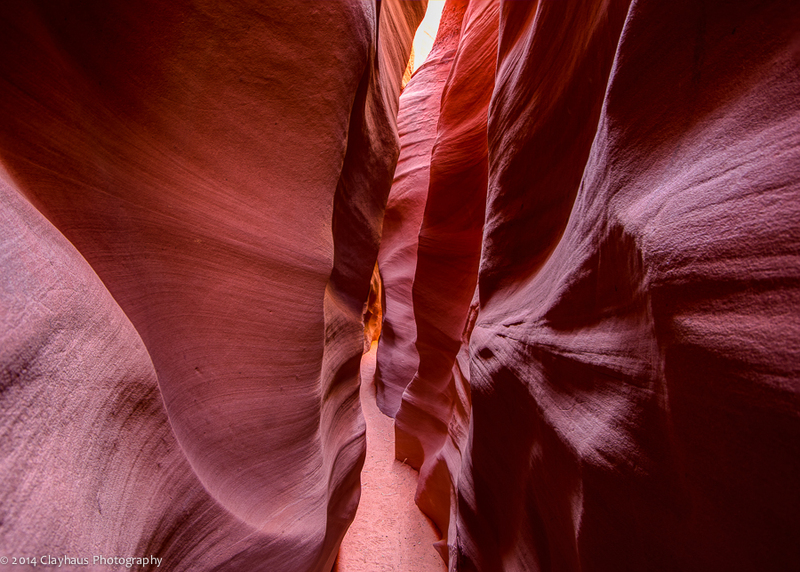 I shed my pack and hat some time ago: the canyon walls are too narrow to tolerate them. Just me and one camera mounted on my thin, travel tripod. Some sections I cannot turn straight-on and I need to watch to not scratch my glasses on the rock, inches in front of me. 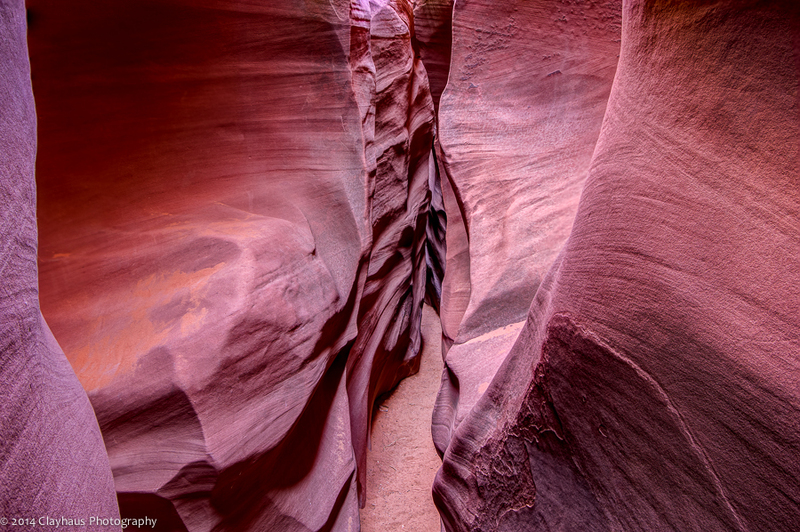 Large people — wide of girth as well as broad of shoulders — should pass on this canyon. It is fit neither for Orson Welles nor John Wayne. Here and there Spooky opens up a bit and these areas are where I do my best to set up my tripod and capture a few slot shots. There is no opportunity to extend the legs of the tripod of course, but I am still able to wedge the rig in such a way that stillness is guaranteed. Often I will roughly calculate the hyper-focal distance, set the lens to minimum aperture (depending upon the lens, somewhere betwixt f22 and f35) and fire away. Today I am spending a bit more time and employing the focus stacking technique of multiple images shot at a larger aperture (f8-f11) and focused on different spots, near to far. In Photoshop I will when stack these images to produce a sharp image, from the sand grains millimeters away to the furthest walls, perhaps 10-15 meters distant. There is nothing spooky about Spooky. There is nothing really scary about Spooky either. Unless, of course, you hear a thunderclap and see a trickle of water quickly forming. 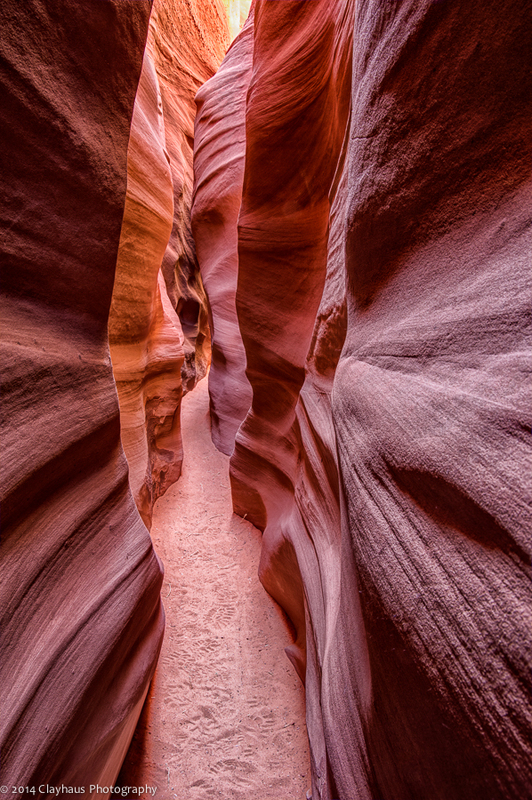 Then ‘scary’ is an adjective that might be deployed, though, there are many other modifiers that more closely convey the sense of fear and building panic that I can imagine one would feel, deep in a slot canyon, with a storm approaching. Today though is a blue-sky desert day; the perfect time to visit a slot called Spooky. Your photos, as always, are exquisite. 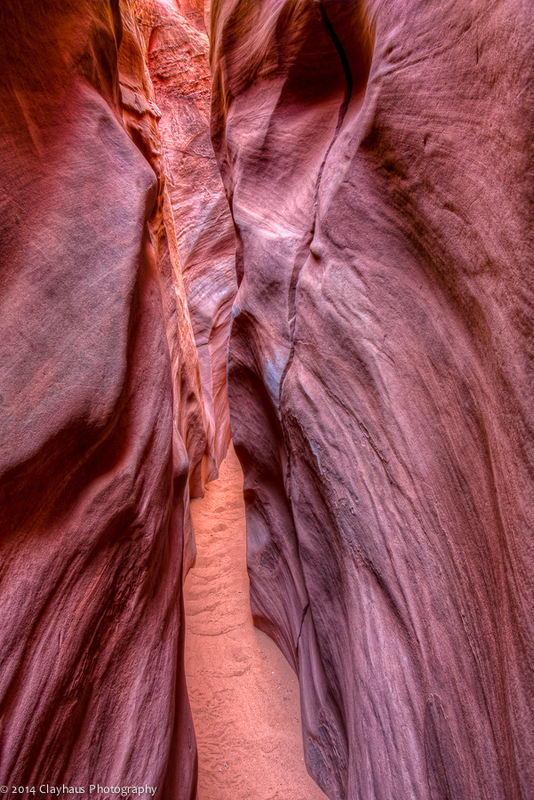 There’s a famous slot canyon called Antelope Canyon around Page, Arizona, now the gateway to Lake Powell. It’s on an Indian Reservation (Apaches, maybe, but maybe Navajo), and you go to somebody’s tarpaper house in the middle of nowhere and they give you a bumpy pick-up ride to the canyon. They come back to get you later, when they feel like it. You’re there with a very small cadre of German tourists, so the fame of the place is global. Not as remote as Spooky, so it’s widely photographed. Nice to have these brilliant pictures of another of these wonders of nature. Hi Roy…Thanks for taking the time to read the post and leave comments. 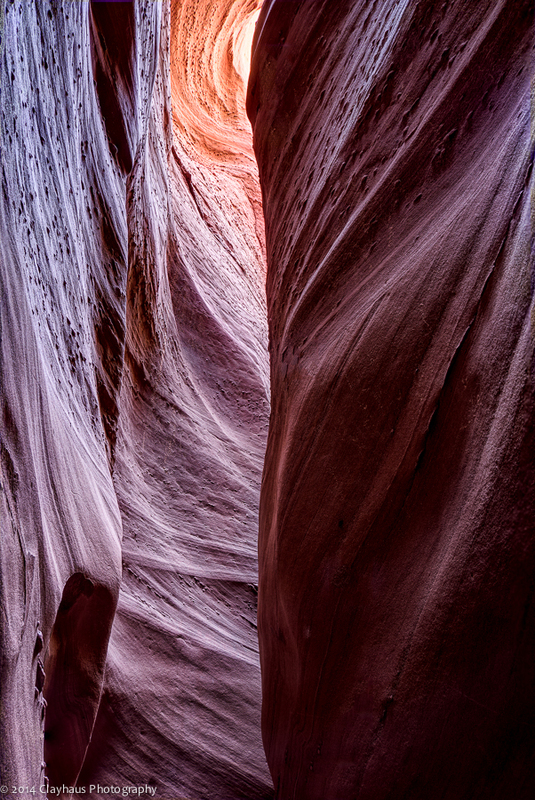 I am quite familiar with Antelope Canyon from the numerous photos I have seen posted by other photographers. (The one time I went there to photograph it there was too much water in it!) The first time I heard of the canyon was in August 1997 when 11 tourists died during a flash flood. Years ago in western Nevada I witnessed a hours-long flood raging out of a desert canyon. Fortunately I was on relatively high ground, though we were just a few feet above the torrent. Trees and boulders were being carried downstream very quickly. Being caught in a narrow defile with that coming down would be ‘curtains’ as they say.